Due to site downtime on GiveOUT Day May 15th, non-profits raising funds across the country lost two and a half hours of access to their Razoo fundraising websites. Many organizations, including us, encouraged people to give offline to continue the momentum. 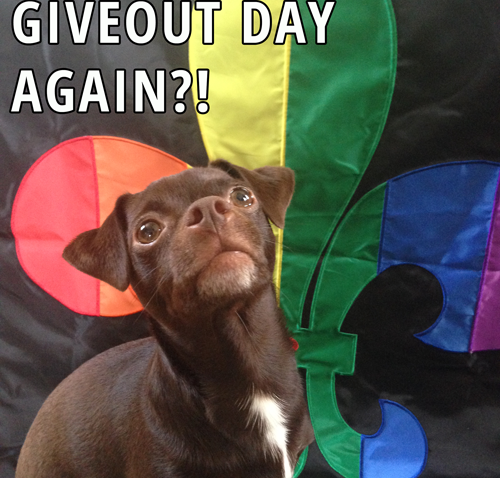 To make up for lost time GiveOUT Day has extended until 11pm CST Friday May 16th. We also have a matching grant from an anonymous donor- if we reach $900, they will contribute $100 to get us all the way to our goal! If you haven’t get, please consider donating to the LGBT Center of New Orleans. Every little bit helps, and we thank you from the bottom of our hearts!